* The disproportionate risk low-income seniors face from fall hazards in their homes. * The benefits of helping seniors who want to age in place. * A gap in the current continuum of care for some patients undergoing joint replacement. * The availability of surprisingly simple and low-cost home repairs and modifications. * Solid evidence of the effectiveness of these interventions. * The growing trend in other states to address fall hazards in the home. 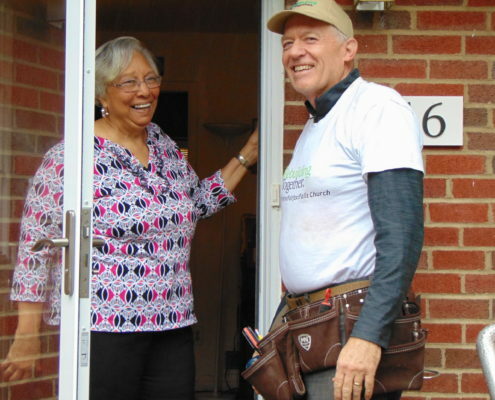 Rebuilding Together Arlington/Fairfax/Falls Church (RT-AFF) is answering the call to fix homes and help seniors age in place with a new delivery system called Rebuilding Together Express. We look forward to exploring with health care providers, insurers, and hospitals practical ways to correct fall hazards in the home, protect those at high risk of falls, and reduce hospital re-admissions and health care costs. Falls are the leading cause of injuries and deaths from injuries among older Americans. One third of people 65 and older fall each year. More than 90 percent of hip fractures occur as a result of falls, with most occurring in people over 70. The cost of falls in the home exceeds $100 billion per year. With more than 10,000 older Americans turning 65 each day, the number of fall-related injuries and deaths is expected to surge, according to the Centers for Disease Control and Prevention, resulting in concomitant cost increases unless preventive measures are taken. Accessibility modifications are vital because homes that once met occupants’ needs pose increasing hazards as homeowners age. As one Virginia homeowner said, “I’m doing OK getting older, but my house is not keeping up with me.” Many low-income homeowners simply can’t afford to make repairs. Modifications that provide safe ingress and egress to the home give occupants flexibility to travel to receive health care – at significantly lower cost than institutional or home care. Behavioral and educational strategies are essential to preventing falls, but a comprehensive approach requires attention to fall hazards in the home. “Taking a balance class doesn’t change the 10½-inch drop in the top step from my front door,” noted one Virginia homeowner. RT-AFF’s most common home modifications to prevent falls include grab bars in bathrooms, double handrails on stairs, comfort-height toilets, and brighter lighting. Hazards are easily identified by visual inspection through a 60-90 minute Home Safety Checkup. The prevalence of fall (and other) hazards in low-income seniors’ homes is strikingly high. (See the Before data in Appendix D) Targeting home modifications to those at highest risk significantly increases the return on investment. In most cases, measures to correct these hazards are relatively simple and low cost. For these 75 pilot projects, RT Express teams of 4-5 skilled volunteers corrected 93% of fall hazards and 90% of all hazards through half-day projects at a cost of about $500 per home for materials. Although housing is invariably acknowledged as a “social determinant of health,” most health care providers and insurers have long viewed correcting fall hazards in the home as “somebody else’s job.” RT-AFF’s experience with RT Express suggests it’s time to take a fresh look. More than a dozen state Medicaid waiver programs are getting positive results. Michigan’s Medicaid waiver program is adopting the CAPABLE model. North Carolina’s PACE program provides critical repairs and accessibility modifications as an integral part of its all-inclusive care. Virginia Medicaid program’s shift from fee for services to managed care provides strong incentives for Managed Care Organizations to provide cost-effective home modifications to prevent falls. Recent increases in the incidence of falls among seniors in Northern Virginia and the pressing need to reduce hospital readmissions justify area hospitals’ support for expanded fall-prevention strategies. 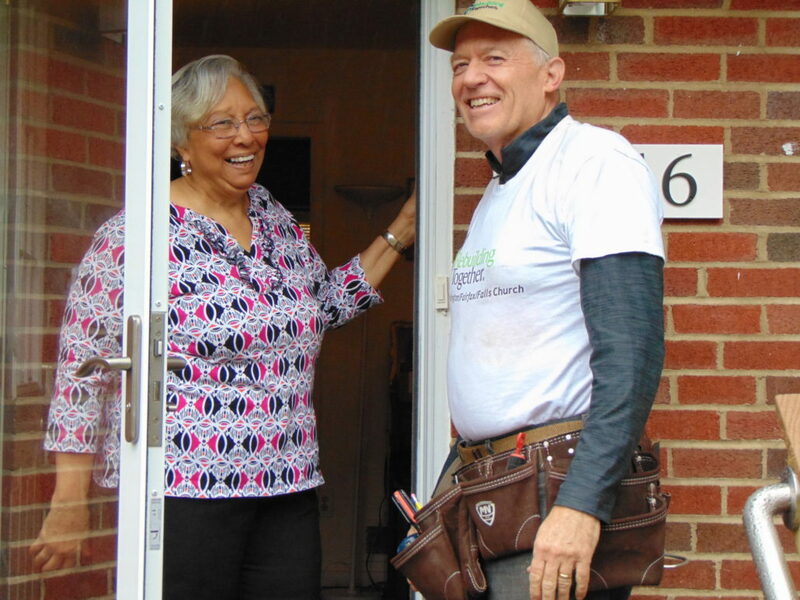 Rebuilding Together Arlington/Fairfax/Falls Church (rebuildingtogether-aff.org) invites health care providers, hospitals, and insurers to consider how Rebuilding Together Express home repairs and accessibility modifications can help protect your patients and clients from falls. Runyan CW, Casteel C eds. The State of Home Safety in America: Facts about Unintentional Injuries in the Home: Second Edition 2004. Washington DC: Home Safety Council; 2004. [vii] H. Stephen Kaye, Charlene Harrington, and Mitchell P. LaPlante. 2010. Long-Term Care: Who Gets It, Who Provides It, and How Much? Health Aff. 29(1); 17–8, 21. [viii] Keall MD, et al. Home modifications to reduce injuries from falls in the Home Injury Prevention Intervention (HIPI) study: a cluster randomized controlled trial, The Lancet. 2015; 385(9964): 231-8. [ix] Szanton SL, et al. Home-based care program reduces disability and promotes aging in place. Health Aff. 2016; 35(9): 1558-63. [x] Ruiz S, et al. Innovative Home Visit Models Associated With Reductions in Costs, Hospitalizations, And Emergency Department Use. Health Aff. 2017; 36(3); 425-32. [xi] Forbes Magazine, May 17, 2017. Appendix A – Healthy Aging: A handyman might be the key to aging in your own home.